The United States released $8 billion in frozen assets to Iran on Sunday in a move meant to ensure Tehran’s compliance with a nuclear pact signed over the weekend, according to top Iranian officials. Iranian government spokesman Mohammad Baqer Nobakht confirmed on Monday morning that the U.S. government had unfrozen $8 billion in assets that had been previously blocked by the Obama administration. The confirmation followed multiple reports of the release on Sunday in the Arab and Iranian news outlets. Iran will be provided with about $7 billion in sanctions relief, gold, and oil sales under a nuclear deal inked late Saturday in Geneva with Western nations. Iranian officials lauded the deal as a path to opening up greater trade relations between Iran and the world. "The agreement will open a new path towards Iran," Alinaqi Khamoushi, the former head of Iran’s Chamber of Commerce said on Sunday as he announced the release by the United States of some $8 billion in assets, according to the Islamic Republic News Agency (IRNA). Nobakht confirmed the figure early Monday during a briefing with reporters in Tehran. "The agreement will ease the anti-Iran sanctions, which will have significant impacts on the Iranian economy," the state-run Fars News Agency quoted him as saying. One senior GOP aide on Capitol Hill was not pleased with the reports. "It's pretty clear the White House and State Department have been lying to the American people since the beginning of this process so it wouldn't shock me to learn they are lying about how much sanctions relief they're giving Iran now," said the aide. Sen. Chuck Schumer (D., N.Y.) criticized the deal on Sunday, when he said to a Jewish audience that both Democrats and Republicans in the Senate were united in opposition. "Democrats and Republicans are going to work to see that we don’t let up on these sanctions … until Iran gives up not only all of their weapons but all nuclear weapon capabilities," Schumer said. "I want to leave you with that assurance." The State Department denied that sanctions have been altered since an interim deal with Iran was announced. "This report is false. Sanctions today are same as they were last week," a senior State Department official said in response to the Fars report. "We will be forthcoming with guidance on how the technical terms of the relief package are worked out once all that is determined." Additionally, Iran announced on Sunday that its nuclear work will continue despite the deal, which aimed to curb Tehran’s nuclear ambitions and enrichment of uranium, the key component in a nuclear weapon. Iranian foreign minister Javad Zarif, who helped ink the deal, praised it for recognizing Iran’s right to enrich uranium, a key sticking point that had delayed the deal until Saturday evening. "The [nuclear] program has been recognized and the Iranian people’s right to use the peaceful nuclear technology based on the NPT [Non-Proliferation Treaty] and as an inalienable right has been recognized and countries are necessitated not to create any obstacle on its way," Zarif told reporters over the weekend. "The program will continue, and all the sanctions and violations against the Iranian nation under the pretext of the nuclear program will be removed gradually," he added. Iran’s most well-known nuclear sites will remain operational under the deal, according to Zarif, who presented a very different version of the agreement than that described by the White House on Saturday. Over the next six months, Iran will see "the full removal of all [United Nations] Security Council, unilateral and multilateral sanctions, while the country’s enrichment program will be maintained," Zarif said. The Fordo and Natanz nuclear sites will also continue to run, he said. "None of the enrichment centers will be closed and Fordo and Natanz will continue their work and the Arak heavy water [nuclear reactor] program will continue in its present form and no material [enriched uranium stockpiles] will be taken out of the country and all the enriched materials will remain inside the country," Zarif said. "The current sanctions will move towards decrease, no sanctions will be imposed and Iran’s financial resources will return." America recognized Iran’s right to enrich uranium up to 5 percent under the deal, according to both the Iranians and a White House brief on the deal. The United States agreed to suspend "certain sanctions on gold and precious metals, Iran’s auto sector, and Iran’s petrochemical exports, potentially providing Iran approximately $1.5 billion in revenue," according to a fact sheet provided by the White House. 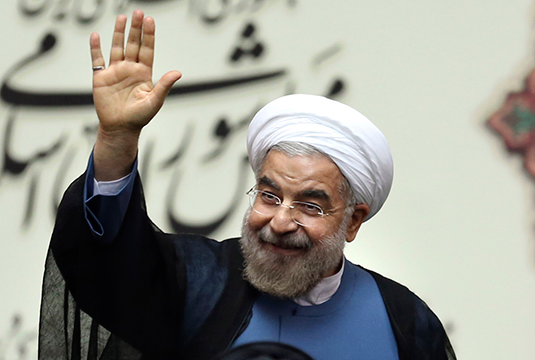 Iran could earn another $4.2 billion in oil revenue under the deal. Another "$400 million in governmental tuition assistance" could also be "transferred from restricted Iranian funds directly to recognized educational institutions in third countries to defray the tuition costs of Iranian students," according to the White House.